You'd be lying if you say you didn't get any goosebumps when Mark Hamill’s voice tells Rey "We’ve passed on all we know. A thousand generations live in you now. But this is your fight.” The first teaser of Star Wars: Episode IX dropped today and it opened with Rey panting in the desert. Was it intentional on the makers' part and a way to pay an ode to Finn? Remember how The Force Awakens trailer saw him panting similarly? This 2minutes 3 seconds long teaser gave us a brief insight into this final part of the trilogy and there's enough scope to get y' all excited. ‘Women Are Stupid Wh*res’! An Amazon Prime User’s Review of ‘Solo: A Star Wars Story’ Makes Twitter Wonder Which Girl Broke His Heart! 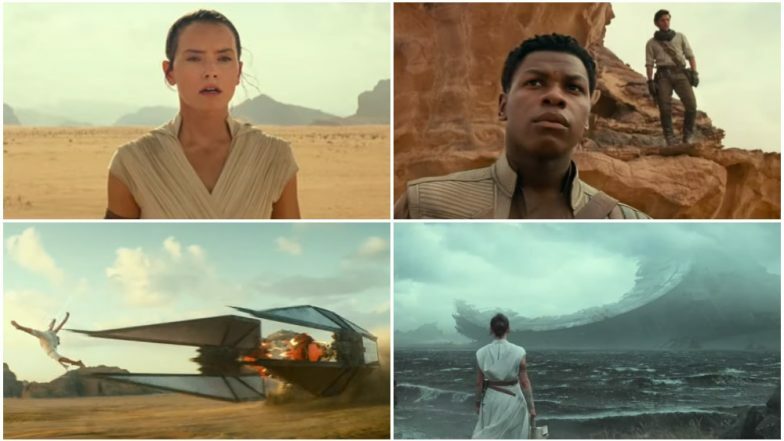 A determined Rey is then followed by few scenes of Kylo Ren fighting in the forest, Finn, Poe and C3PO flying through the desert and the end that sees Rey and her crew looking at the Death star wreckage. This first teaser was unveiled during the “Episode IX” panel at the Star Wars Celebration event in Chicago. And director J.J Abrams in his same interaction revealed that the movie doesn't exactly pick from where The Last Jedi ended. “Some time has gone by," he said. When asked to describe this movie, he said, "It’s about this new generation and what they’ve inherited the light and the dark, and asking the question as they face the greatest evil, are they prepared? Are they ready?” And that reminds us about the time when Abrams himself wasn't ready to come on board for this final part. The Lego Movie 2, Aladdin, The Lion King, Star Wars Episode IX - 30 Hollywood Non-Superhero Movies of 2019 We are Super-Excited About! Lucasfilm had a fall out with its original scriptwriter and director, Colin Trevorrow and Abramswas roped in as his replacement. However, to have a fresh perspective on this new project, he asked Justice League writer Chris Terrio to help him with the script and the latter was more than willing. The director is still terrified if he'll be able to end this trilogy with a bang and going by its first teaser, we see no reason why. Stars Wars Episode IX Trailer Will Release on THIS Date?